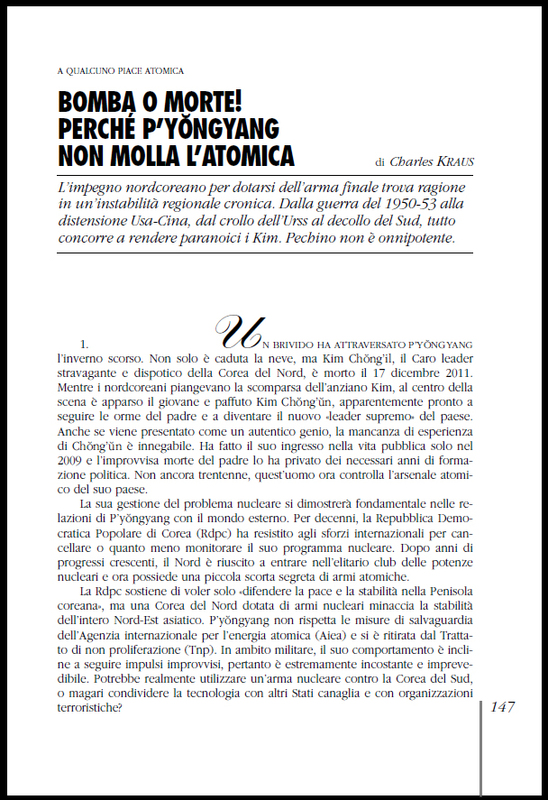 I just received page proofs for an article I am publishing this month in Limes, an Italian geopolitical magazine. My article is appearing in a special issue specifically on nuclear weapons organized by Leopoldo Nuti. I had originally chosen somewhat of timid title for the article, “The Korean Peninsula and Nuclear Weapons: An Historical Perspective,” though the editors opted for something more eye catching: “Bomba O Morte! Perché P’yŏngyang Non Molla L’Atomica” (“Bomb or death! Why Pyongyang does not give up its atomic weapons”).